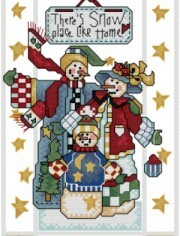 The pattern is designed by Alma Lynne and is in book #22150, "there's no business like Snowbusiness". The pattern displays 3 snowmen as a family standing under a sign. Size: 5 1/4" x 8 7/8"
Printed: $4.99 We'll print the design on 32lb paper with color backstitching and black & white symbols and mail it to you. S&H charges will apply. With Supplies: $26.46 We will ship you the printed design, 22 skeins of DMC Floss & Wichelt 14ct. 18" x 21" Aida (Ivory) to complete your project.